Businesses of all sizes—from high-growth companies to large enterprises—are currently experiencing organization-wide digital transformation. Procurement leaders are moving beyond legacy back-office and procurement systems to embrace strategic technology. IDC reviewed 13 SaaS and cloud-enabled procure-to-pay software vendors, naming Coupa as a leader in their inaugural report. 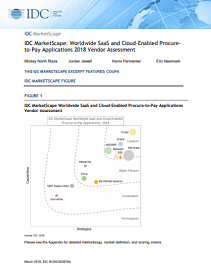 In addition, the IDC MarketScape noted that you should consider Coupa "when looking for a holistic and extremely encompassing unified procurement platform including procure to pay that is available anywhere and anytime." Drive Cost Savings, eliminate wasteful spend.